Clicking through beautiful pins on Pinterest is a good place to start. But as you’re pinning wildly stunning luxe bathrooms to your inspiration board, you might want to take a second to consider what exactly you’re pinning. Do you need those heated floors? How serious are you about that rainfall shower head? Can you really afford a vintage claw foot tub? Although these images may be well-suited for a magazine cover, they might not be right for your home. Consider bits and pieces from each of your favorite dream bathrooms. Choose the elements that you can’t live without from each and opt for affordable materials, too. For example, instead of using expensive tiles, consider a laminate flooring option complete with a tile or slate look to recreate the aesthetic of your dream bathroom, for considerably less. Remodeling a bathroom doesn’t come cheap. 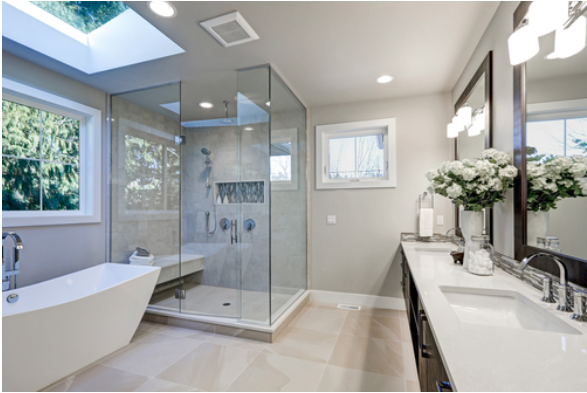 However, a bathroom overhaul is considered one of the top home renovations for a high ROI. In fact, according to a recent survey, renovators can expect an 80 percent return and an increased home value. So, how much can you expect to pay? While the average cost to remodel a bathroom hovers around $11,000, data from the National Kitchen and Bath Association shows that Millennials ages 18 to 34 give up a bigger chunk of change when it comes to remodeling, paying $16,421 to complete a bathroom remodel. Of course, each project is different. You might find that you can save in places where you don’t need to do work, like doors and windows, for example. Take a hard look at your bathroom budget before you start any work. You do not want to be left without the amenities of modern day plumbing. Completing a bathroom remodel takes work, time, patience and a specific skill set. If this is your first time taking on a big project get help from a professional. If you’re starting from scratch you’ll want to hire an architect. A professional architect can build out a new bathroom from floor to ceiling and window to window, keeping in mind electrical, plumbing and other important factors. It’s best to hire an architect if you’re adding an extension, or again, starting from scratch. Even if you’re not starting from the ground up you’ll want to hire the right people to get the job done. Hiring an expert plumber or electrician to take care of the more complex areas of the job will not only save you time and frustration, but you might just find that it will save you money, too. When it comes to aesthetic additions, these can be handled with a DIY-approach; there’s no need to hire a handyman to install new handles on your vanity cabinets. Improving a bathroom in your home shouldn’t make you feel like you’re flushing money down the toilet. With these smart tips you can be on your way to taking a seat on a new throne.